When I spent $20 on beef tenderloin meat that would not be rubbed and roasted, but chopped and grilled on a skewer – I did have the same reaction as my butcher. “Don’t you want a cheaper meet for a kabob?” Well, I was curious if it made a difference and, well, the recipe called for it so I wanted to do as told. Yes, it makes a difference. The marinade also gives it an amazing flavor and color. The soy and paprika give the meat a “wow” color and the honey gives it a glistening glaze. The mustard isn’t overpowering, which surprised me, but gives it a great tang. These need to marinate for at least 4 hours so I would do this one on a Saturday or Sunday night. I made this with some couscous and it was amazing. 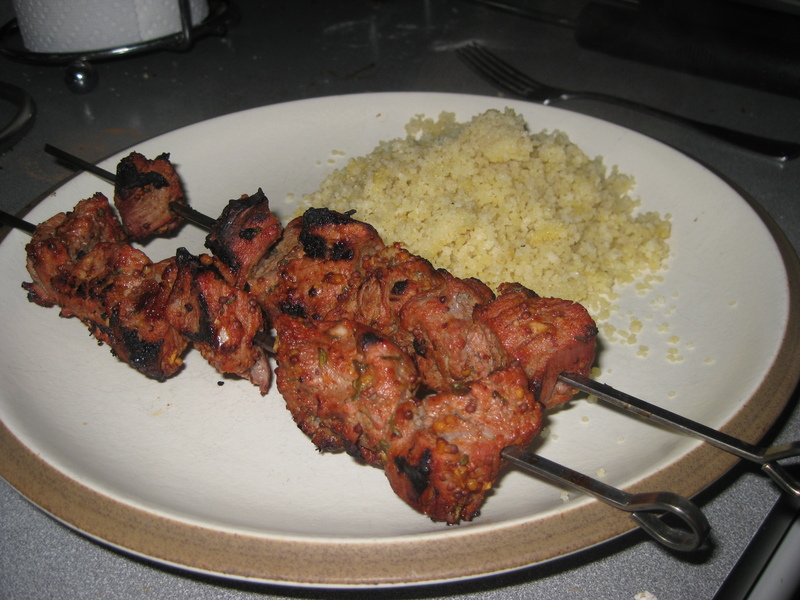 This was also the first time I made skewers with my new metal skewers. I highly recommend them. Gone are the days of soaking wooden skewers in water for 30 minutes before using and still having them burn at bit on the grill. With the metal ones, just make sure to put some oil on them before threading the meat so it doesn’t stick. Thanks to Bobby Flay for this one! Whisk together all of the ingredients in a small bowl,cover,and let sit at room temperature for at least 30 minutes and up to 4 hours before using. Cut the tenderloin lengthwise in half, then cut the halves lengthwise in half again. Slice crosswise to make 24 equal pieces. Skewer 2 pieces of beef onto each skewer, keeping them together at one end of the skewer. (This will make the grilled skewer easier to hold and eat.) Place the skewers in a baking dish or on a baking sheet, pour half of the glaze over the meat, and turn to coat. Grill the meat, turning once and brushing with the remaining glaze, for 4 to 6 minutes until golden brown, slightly charred, and cooked to medium-rare. Transfer the skewers to a cutting board and let rest for 5 minutes. Place the skewers on a platter and serve hot or at room temperature.